We all want our audiences to consume as much of our content as possible. After all, the benefits are clear: the more articles a visitor reads, the more engaged with your website they become. This results in a more loyal readership, regular visitors, more social shares, and, ultimately, more conversions — in other words, all the stuff you really need. This can put you in the search engine’s good books too: Google’s ranking algorithm analyzes on-site metrics — of which social shares, bounce rate, page views, and time on-site are key considerations — and good performance can give your site a timely boost up the SERPs. More visibility, more visitors. Awesome, right? 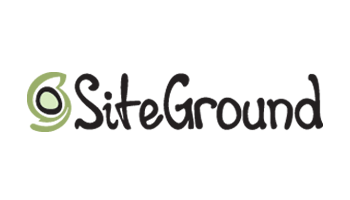 Of course, there is more to it than ensuring your visitors won’t physically leave your site. For example, a popup that appears when a visitor signals intent to leave can keep some visitors on site, but not in the way you want — it’s a shady tactic (when used for this purpose). We want visitors to want to stay and genuinely enjoy their time on the site. With this in mind, you need to ‘guide’ your audience towards areas of your website they will enjoy, therefore encouraging them to remain on your website for longer of their own accord. Internal linking is an obvious means to do this — as is the use of a related content widget placed below each article (something we covered a while back). Today I want to help you guide visitors towards the posts with built-in social proof: your most popular posts. And, because these are the posts that are proven to resonate with your audience, they are also likely to be your best — in other words, your conversion drivers! 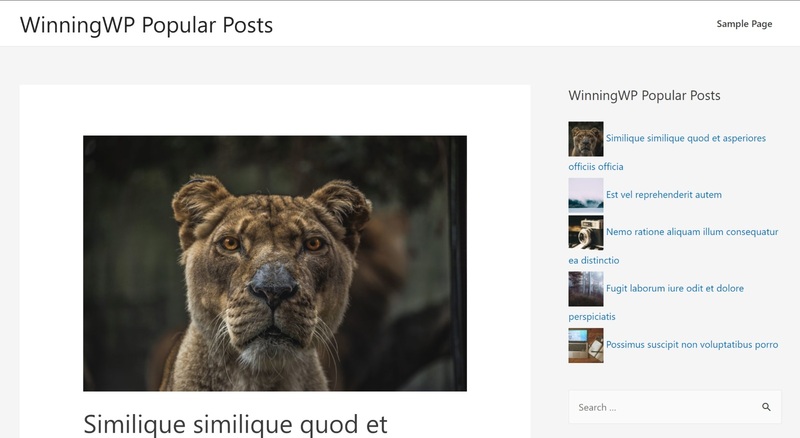 With over 300,000 active installs, the creatively named WordPress Popular Posts plugin is the most popular popular posts plugin at WordPress.org (see what I did there?). 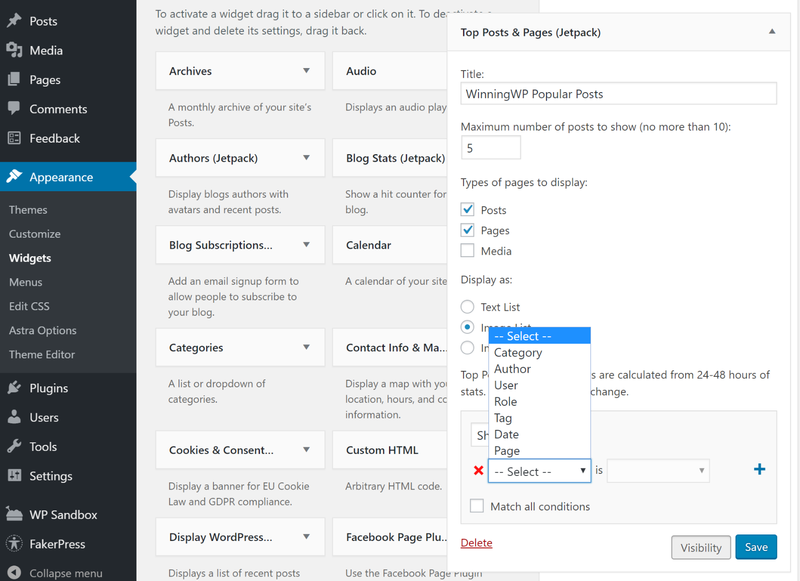 Beyond being super easy to use, WordPress Popular Posts lets you choose a custom time range for your popular posts. Because you can create multiple separate lists, this lets you do some cool stuff like creating separate lists for your all-time most popular posts, as well as the most popular posts from the last X days. 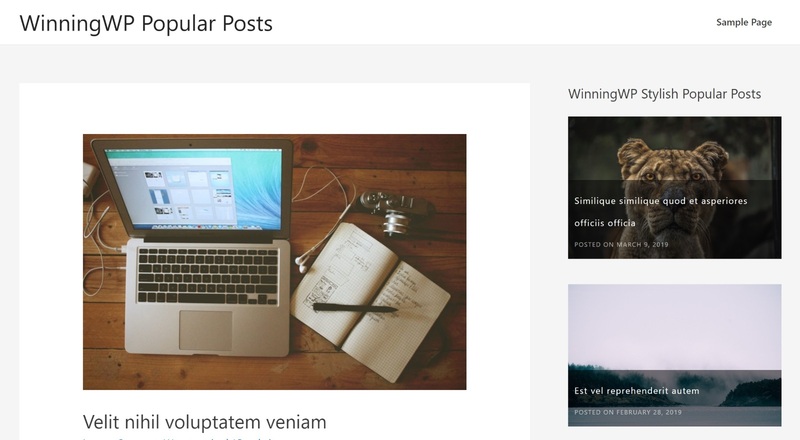 WordPress Popular Posts also works with any custom post types that you’re using. 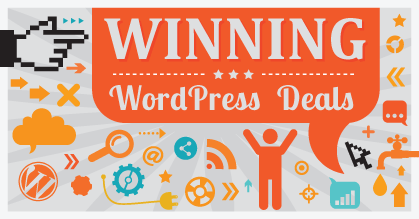 To give you those sorting options, WordPress Popular Posts actually tracks the traffic to each post on your site. 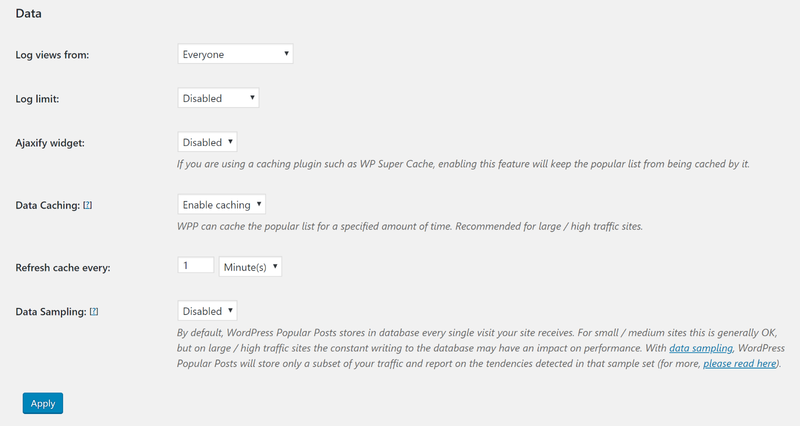 If you’re worried about the performance hit, WordPress Popular Posts offers lots of performance tweaks to address this, like pageview caching and data sampling. You can learn more at its GitHub page. 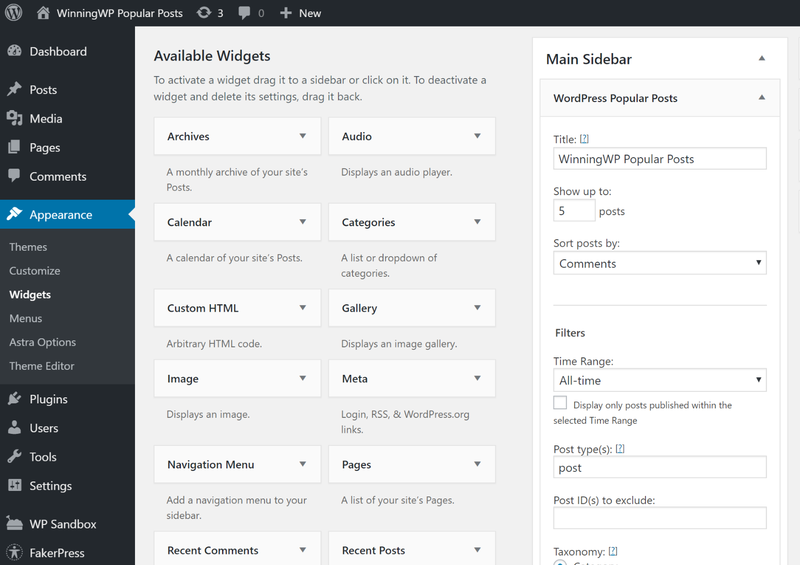 To help you display popular posts, you can use either a WordPress widget, shortcode, or PHP function. Beyond that, WordPress Popular Posts also gives you a dashboard where you can see your most popular content over certain time ranges, as well as a settings area where you can enable some more technical features that affect performance. All in all, quite flexible and easy to use! 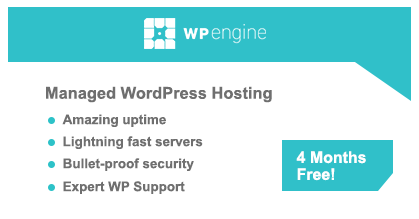 After WordPress Popular Posts, Top 10 is the second most popular free option at WordPress.org. It lets you display your most popular posts by daily traffic or overall traffic (there’s no comment popularity option, though – you’ll need a different plugin for that). Top 10 works with regular blog posts, as well as any custom post types that you’re using. Finally, Top 10 also comes with some performance features, like the ability to cache popular post output and periodically “clean” your database by deleting database data that’s more than 90 days old. 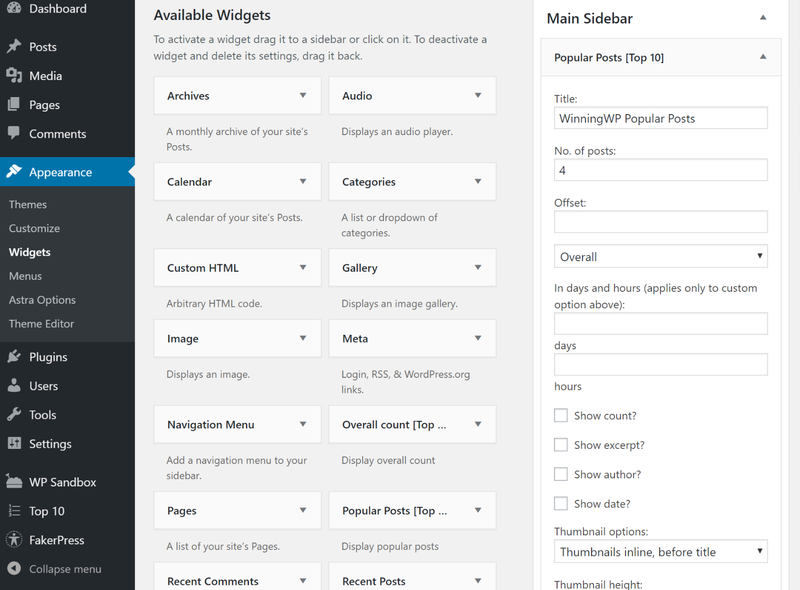 Top 10 also lets you display popular posts anywhere on your site using either a widget or shortcode. Jetpack is a plugin from Automattic (makers of WordPress.com) that offers a whole suite of features. 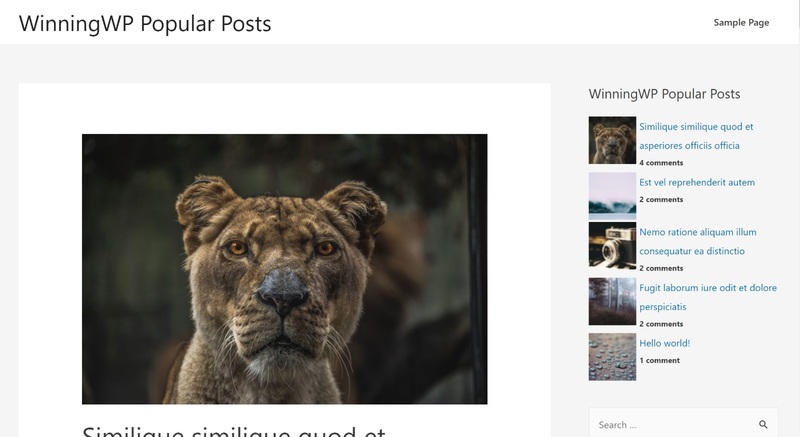 One of those features is…you guessed it – popular posts. I wouldn’t recommend using Jetpack if all you want is popular posts. But if you like the other features in Jetpack, then you might like Jetpack’s all-in-one approach. 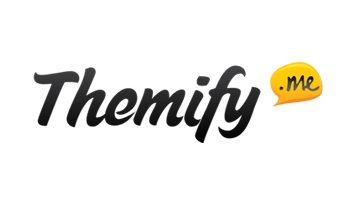 Learn more in our Jetpack guide/review. One downside of Jetpack is that you have less flexibility for defining what a popular post is. Jetpack lets you display your most liked posts or the posts that have received the most traffic over the last 48 hours by default. If you have some tech chops, though, you can use a filter to define a custom date range. Other than that, Jetpack is super easy to use and the output looks good right out of the box. 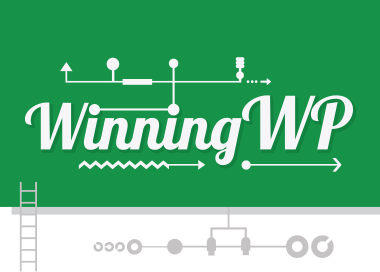 To get started with Jetpack, you’ll first need to run through the Jetpack setup process and connect it to your WordPress.com account (Jetpack will try to get you to sign up for a paid plan – but you just need the free plan for popular posts). Once you get that out of the way, you can activate the popular posts functionality by using the new Top Posts & Pages (Jetpack) widget. While you do get those nice looks, you lose a lot of the customization options you get with the other plugins. So – tradeoffs! 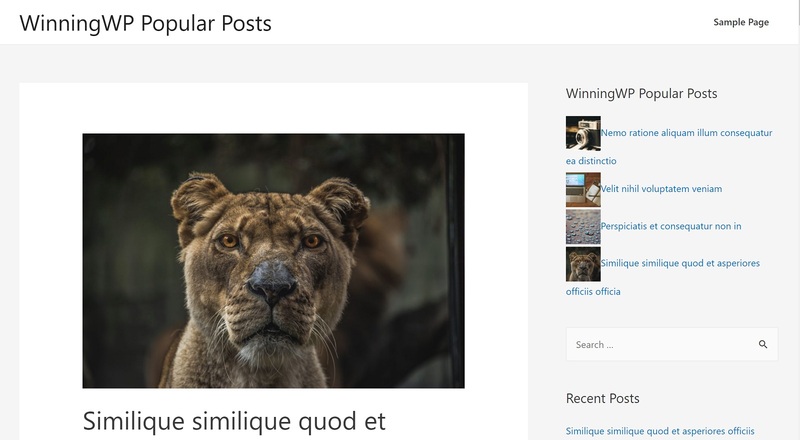 Stylish Popular Posts is definitely the simplest option on this list. Once you install and activate the plugin, all you do is add the widget where you want your popular posts to appear. So if you like that tabbed approach, that’s a big reason to choose WP Tab Widget over the others. There are no settings to configure – as soon as you activate the plugin, you’ll go straight to adding the widget. Note – WP Tab Widget wasn’t working with the theme I used in the other screenshots – that might be something to consider. It worked fine once I went back to the Twenty Seventeen theme, though. 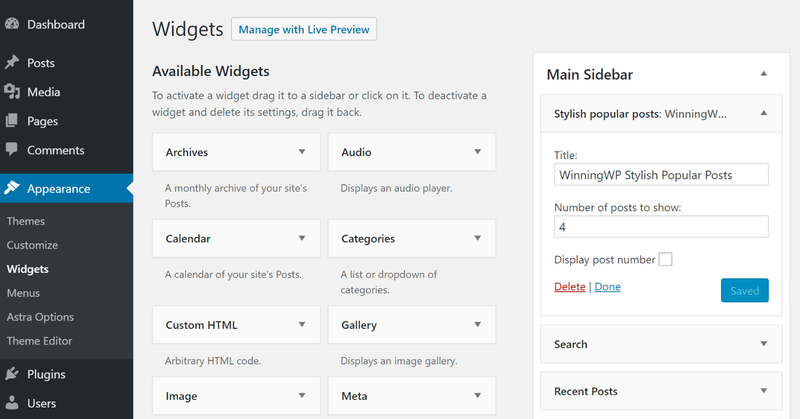 Finally, there’s Display Posts, a free plugin from Bill Erickson, who’s a pretty well-known WordPress developer. So if that’s how you want to define “popular”, this is a good option. Just be aware that there isn’t an option to display posts by the actual traffic they receive. Beyond that, the plugin comes with lots of shortcode parameters that you can use to target posts from specific categories, authors, etc. You can also choose whether or not to include thumbnails, excerpt summaries, and other content. There’s no settings area with Display Posts. Instead, you’ll do everything by using the plugin’s shortcode and many shortcode parameters.  You can then place this shortcode anywhere on your site, including a widget in your sidebar. If you want to display posts by social shares, you can follow these instructions. Displaying your popular content is a great way to get your best content in front of visitors and keep them on your site. With the popular posts plugins on this list, you’ll be able to do that for a variety of different “popularity” metrics, including traffic, comments, and social shares. 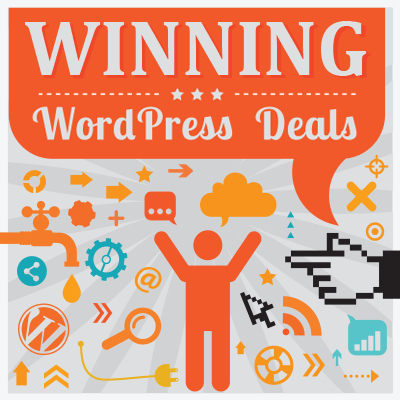 If you want the most flexibility, I’d say go with WordPress Popular Posts or Top 10. 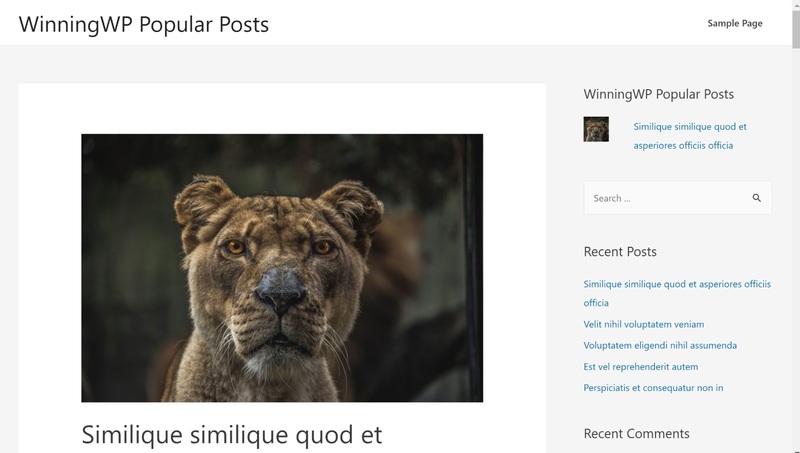 Stylish Popular Posts is good if you like its looks, while WP Tab Widget offers the unique tabbed approach. Finally, Jetpack is great if you want the other Jetpack features, and Display Posts lets you order posts by social shares, which is helpful. Used any of these popular posts plugins? Thoughts? I’m using Top 10. It’s great! !